1. 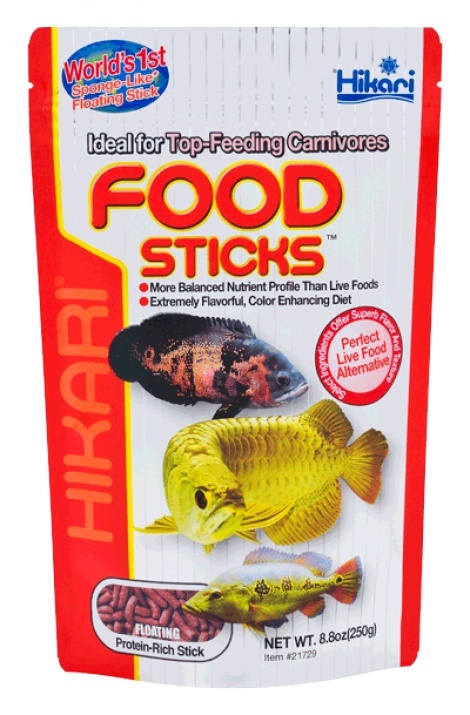 A highly nutritious diet which promotes rapid growth, proper form and vibrant colouration. 2. Developed after extensive study and analysis of the sense of sight, smell and taste of numerous carnivorous fish. Inclusion of key ingredients like DL-methionine and Llysine allowed us to produce a food most top feeding carnivorous fish are eager to devour. 3. New advances in bio-technology helped us identify the highest grade of carotenoid available today which promotes active colour development and retention in UV deficient environments. Your fish will look their best year round! 4. Helps reduce waste and aquarium clouding common with other floating stick type foods. 5. Absorbs water quickly becoming soft yet retains its shape.